Once upon a time, there was a little girl that loved to draw. And as they say, the rest is history. What is the best Christmas present you can give her, when she is all grown up but still hungry for art, still wanting to create so much that the house is smaller for her? 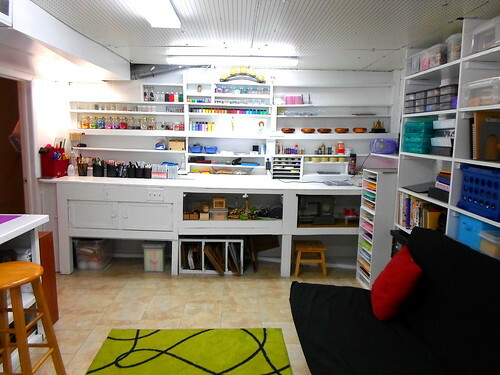 Well, my lovely better half had it all figured out, for when I was desperate what to do with arts and crafts spilling out in every room( especially since I opened my Etsy store), he found the solution. Once considered practically unusable, a part of our basement was converted to my very own studio- something I never dared hoping for, nor I expected it to ever happen. Now, please do not imagine that this "fairy tale" happened with the swish of a magic wand. I will disappoint you. Alas, it happened with a more than one swish of a non-magic broom, not to mention how many coats of paint, hours of scrubbing, moving, hammering and kneeling it took to get it to the condition it is in now. And I am very proud of us, we did it all together with out own hands. 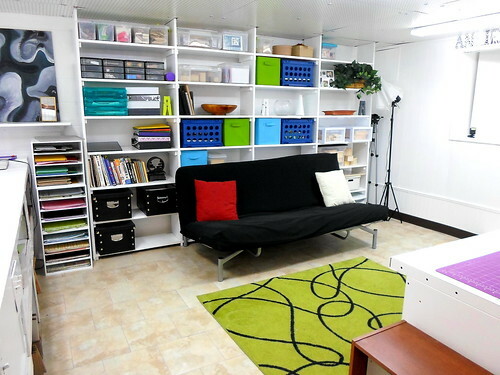 The ceilings, the floor, the lights ( all daylight by the way), the white paint, all made it look so much better. The sign was made by me and I think it fits the overall idea of the workshop. Of course it is still not completely finished, we have to install the countertops, but there is still time. Considering that we bought very few things to renovate the place and reused what we already had, the time frame to finish it and all the effort we put in, it is much more that I could have hoped for. 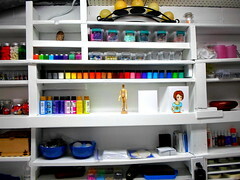 And my favorite part - little nooks and crannies for all my colorful supplies. What a treasure the previous owners left us! 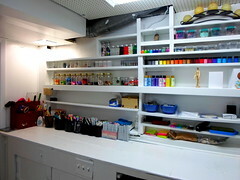 I believe that the elderly couple that lived here before us used this room as a workshop as well. The gentleman used to make clocks if I am not mistaken and I am surely grateful to him for finding a way to use every last bit of space to put shelves in. Although I did not always feel that way, considering how much time it took me to paint all of them. 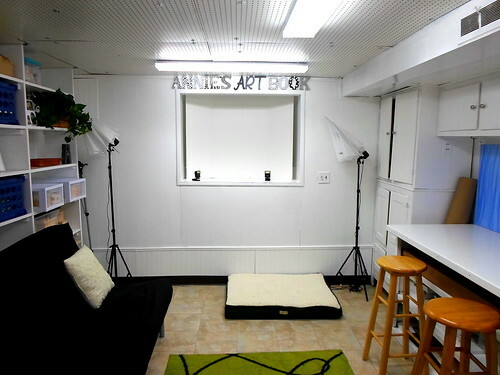 So, this is where all the Annie's Art Book magic will happen from now on. It's all mine and I adore it!